Dutch / traditional style forks with crown. Made of steel. Traditional gloss black as well as other colours available. All have dynamo brackets on the left side, some also have the required bracket for a hub brake on the front wheel. 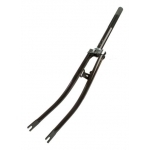 These forks have a one inch (25.4 mm) threaded steerer tube for use with quill stem. 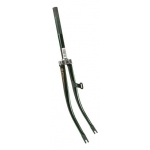 The steerer tube on the ETRTO 622 fork is 265 mm long and the thread 135 mm (see additional photos). That for the ETRTO 635 fork is 340 mm long and the thread length is 240 mm. 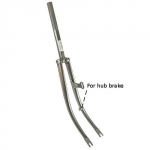 Due to the long steerer tube they will fit a wide range of bikes, you can cut this down with a hacksaw to your required length. Note that the exact lengths do vary. The ETRTO 622 size is the most common. The 635 size is used on some very traditional Dutch bikes as well as on old English police bicycles. In both cases you should find the size of wheel written on the side of your existing tyre or wheel. Commonly, a width is also included - i.e. 37-622 means a 37 mm wide tyre on a 622 mm wheel. Both these wheel sizes are often referred to as 28". 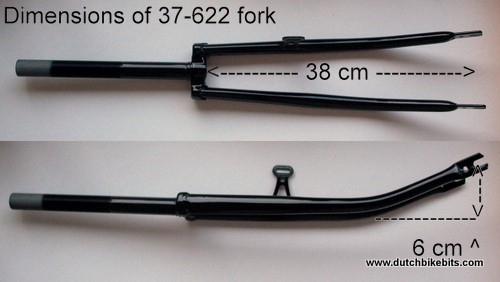 The 27" size is in between the two (630 mm). 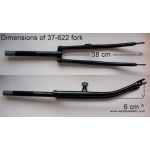 Forks for 622 can generally be used for 27" wheels. There is only a 4 mm difference in radius. Mudguard clearance is a little less. 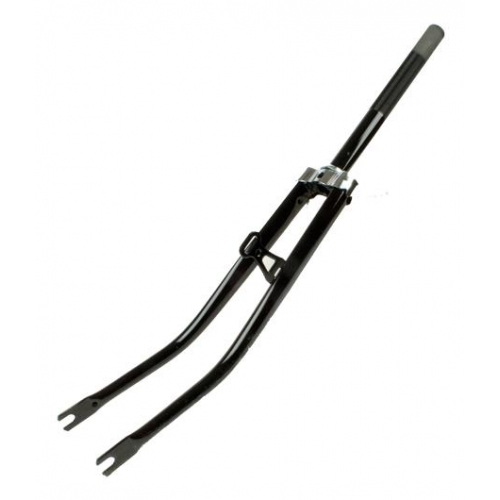 There are also forks available for 26 x 1 3/8" wheels, ETRTO size 590. If unsure about which size you need, please read our guide to tyre and wheel sizes. For distance between fork and axle and offset dimension, see additional images. Note that this shows one fork from stock in one size. Also note that we have more than one supplier and dimensions may vary a little.